Welcome to the next post of Disney Extinct Attractions. My name is Cole Geryak and I’ll be your Genie on today’s unofficial journey on a magic carpet. 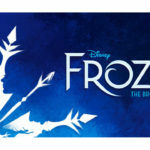 Earlier this week, the creative forces behind the upcoming Broadway debut of Frozen were officially announced, proving Frozen fever is not even close to ending, yet. 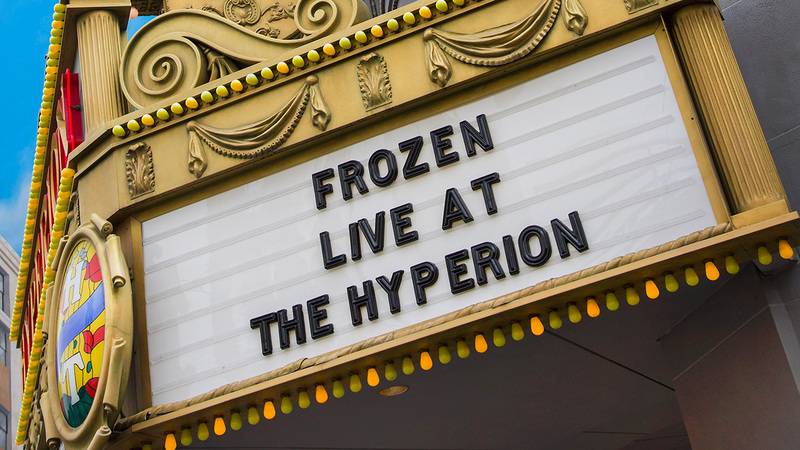 Funnily enough, this past year also saw the opening of “Frozen — Live at the Hyperion” at Disney California Adventure. Having seen this show three times over the summer, I have to say that it is truly a stunning show to watch. A full hour long, guests get the chance to watch a Broadway-calibre show with great performances and stunning scenery, all included in the price of admission. However, the performance has a lot to live up to because of the success of its predecessor Disney’s Aladdin — A Musical Spectacular. Aladdin debuted on November 25, 1992 during the middle of the Disney Renaissance and with very big shoes to fill following the enormous success of Beauty and the Beast. While not quite living up to the success of its predecessor, Aladdin was no slouch itself, earning five Academy Award nominations and winning two of them, as well as earning a 94% fresh rating on Rotten Tomatoes (retroactively, of course). The film also made $504 million worldwide on a budget of $28 million, so to say that it was a commercial success is a bit of an understatement, governor. Naturally, this success meant that Aladdin would have an impact in the theme parks as soon as the company could add attractions related to it. In 1993, a dinner show and then storytelling experience were added to Disneyland, as well as an Aladdin-themed parade that also debuted in Hollywood Studios. The Magic Carpets of Aladdin (a Dumbo-style ride) was added to the Magic Kingdom, Walt Disney Studios Park, and Tokyo DisneySea (with each having a different name to really confuse people researching them). All of these attractions had mild success, but none of them truly captured audiences the way that the movie had. On January 16, 2003, the Disney parks finally received the attraction that fans of the movie had yearned for with the opening of Disney’s Aladdin — A Musical Spectacular (which I’m going to refer to as Aladdin for simplicity’s sake). The show premiered at the nearly 2,000 seat Hyperion Theater in Hollywood Land at Disney California Adventure, replacing a show called Blast to the Past that only lasted for one year. What truly set Aladdin apart is the entire scope of the show as it was a full Broadway-style show, albeit a 45-minute version of one. The average Disney show is around 20 minutes because guests are constantly moving from attraction to attraction and don’t generally want to dedicate 45 minutes to a show when there were “more exciting” rides to conquer. But the creators of Aladdin clearly did not receive that memo, though the length of the show never hurt its popularity as Aladdin was one of the longest running stage shows in Disney park history. As you can see above (at an Elton John concert, I believe), the Hyperion Theater in Disney California Adventure is a gigantic theater, matching the scope and length of each performance of Aladdin. 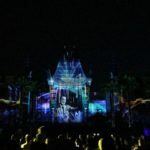 The main reason that guests would consistently show up time after time is because they were able to experience a Broadway-style show that all as part of their park ticket. The show combined the great music and story from the movie with the seamless set changes and superb vocal performances that you expect from a Broadway musical to truly create something that had not been seen before in the Disney parks. But would you believe me if I said that I haven’t even talked about the best part yet? Just as in the film Aladdin, the Genie is what helped the stage show transcend from a great attraction to a truly classic one. Most people would agree that Robin Williams is the heart of the film because, without his performance, it almost definitely would not have left the same mark that it did. 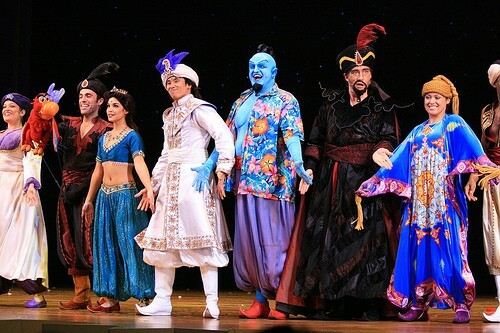 The performers behind the Genie in the stage show leave that same legacy behind. The beauty of Aladdin is that Disney allowed the Genie a lot of freedom in what he chose to say, leading to a different (but strangely familiar) type of humor than what you would normally see in a Disney production. A lot of stand-up comedians were hired to portray the Genie because the character had to be quick on his feet and improvise a lot of his own dialogue, much like Robin Williams in the film. This freedom helped the show stay fresh over the years and made each performance that guests saw truly unique. As we saw with the Genie, the show did have many similarities to the movie (as it should), but it also had to change some things around due to trying to tell the same story in half the time. 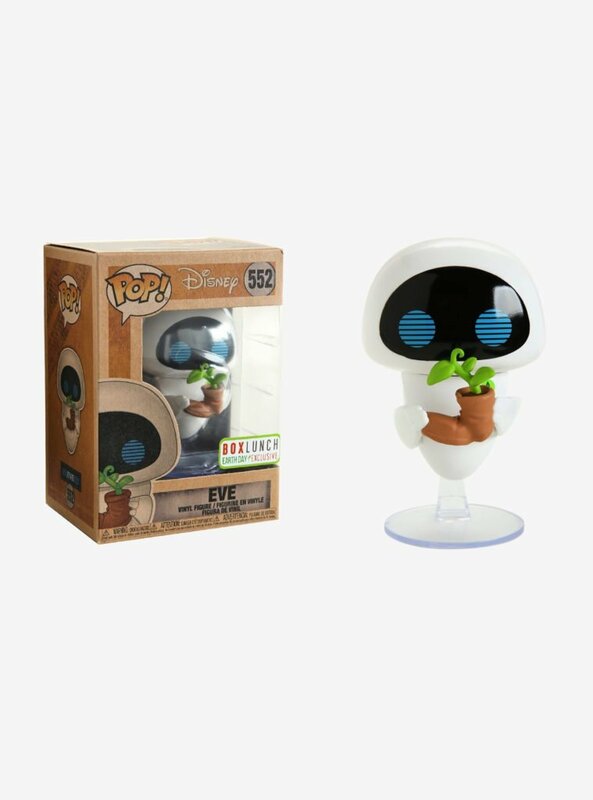 The most noticeable difference is that Abu is absent in the show and there are some other smaller story tweaks that don’t serve to truly change anything. Maybe because I saw it so many times, I actually grew to prefer the stage show’s version of the story due to it really focusing the story on the essentials. Not all of the changes were subtractions, however. In the show, Jasmine gets her own song called “To Be Free,” which I originally never really enjoyed. As I got over my youthful naïvety though, I realized how beautiful the song was and how much it helped progress Jasmine’s own character development. The song adds one more layer to the amazing show that was Disney’s Aladdin — A Musical Spectacular. I’m going to do something a little bit different this time and talk about my own personal experience with the attraction because it meant a lot to me. I went to go see this show almost every time that I went to the Disneyland Resort and it definitely grew on me as I kept experiencing it. Eventually, the only attraction that I would insist on doing when I visited Disney California Adventure was Aladdin because I needed my fix of the Genie’s jokes (mainly to find out what is going on in the pop culture world). 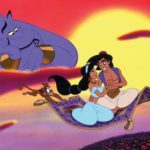 Rumors had been going around for years that Aladdin would be replaced by a musical based on a more recent Disney property (Toy Story and Tangled being two of them, with Toy Story actually being a confirmed change), but the fans of the show managed to keep it around until the behemoth that is Frozen finally brought Aladdin’s 13 year run to an end. I was lucky enough to see the show on the very last day (January 10, 2016) and it was an experience that I will never forget. I waited in line for a Fastpass to the show for nearly two hours, but it was well worth the wait to simply be a part of the energy of the show on that final day. I saw the penultimate showing and I have to say that it was one of the best shows that I ever had the privilege of seeing. You could really feel the emotion of the actors as they performed for all of their fans one final time and I could really feel the Disney magic in that performance. I definitely miss Aladdin, but its run of 13 years is pretty remarkable and it stands as one of the longest running live Disney shows on record. The show at Disney California Adventure has ended, but the show still lives on the Disney Fantasy, a cruise ship that currently sails primarily in the Gulf of Mexico. I am actually blessed enough to have seen the show onboard that ship, as well and, while still a fun carpet ride, it ultimately led to me just wanting to see the show at Disney California Adventure. If you are interested in watching the show, you can find a normal performance of the show right below. But if you want to see the heartfelt final performance ever, then you can find that below this block of text. I included the ones above because they have particularly superb performances by the Genies, but any ones that you can find are sure to be entertaining, so don’t limit yourself to having to watch one that I chose. As I said earlier, each Genie’s performance is completely different and someone was actually awesome enough to put up a best of the Genie, so you can find that below here. If you don’t have time for the full show, definitely check out that video because it is sure to make you laugh! And with that, it is time for this post to take a final bow. But not without the promise of an encore performance next week that follows these clues three. The attraction was an opening day attraction in one of the park celebrating its anniversary in the next week. This attraction utilized the Pepper’s Ghost effect. This attraction was the only one worked on by legendary animator Ward Kimball. I hope that you enjoyed this post, and I want to thank you for reading, as always. I love hearing what you guys think about the posts, so be sure to comment below or reach out through any of the links on my bio. And as always, have a magical day!